As the reigning king of all self defense revolver calibers, the .357 magnum is truly a round to be revered. 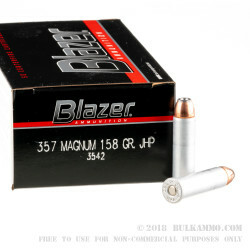 This Blazer 158 grain .357 Magnum JHP is an economical self defense ammunition that is not only affordable, it is also as lethal as they come. What gives the Blazer 158 gr. 357 Mag jacketed hollow point ammo a leg up on the competition is its cheap price. 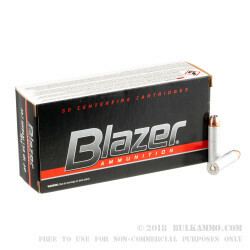 Blazer’s proprietary aluminum based cartridges offer identical chamber pressures and corrosion resistance as their traditional brass counterparts, at less than half the price. This is extremely beneficial to civilian and other law enforcement officers who want to train with the same ammunition that they use to fight, in order to develop a consistent point of aim, point of impact with the targets that they so often have to engage. The semi wadcutter profile of the 158 grain jacketed round makes for a clean reload of the revolvers cylinder and can actually help guide the rounds into their respective holes when using speed or moon clips in order to accelerate the reloading process. 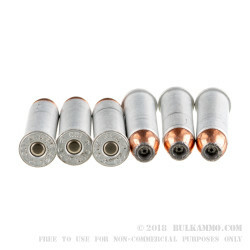 Self defense and law enforcement officers looking for an economical solution to their training and defense needs will be well equiredd, and well budgeted with the Blazer 158 grain .357 Magnum Jacketed Hollow Point. I got these in 3 days, along with another order(faster than what i thought) shot very clean, good groups. Will have to order more, because I am now out again. Q: How much more velocity will .357 magnum get out of a 16" barrel vs. a 6" barrel. A: Going to a 16" barrel from a 6" barrel in .357 Magnum will give a velocity increase of approximately 350fps, depending on projectile weight.